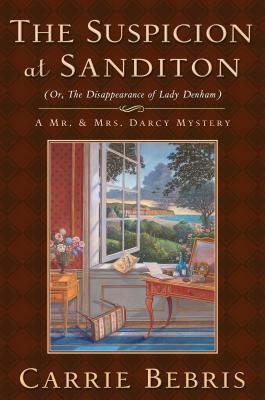 Suspicion at Sanditon, a new adventure in Carrie Bebris's award-winning Mr. & Mrs. Darcy Mystery series, takes Fitzwilliam and Elizabeth Darcy to Sanditon, the setting of Jane Austen's final work. There, accompanied by their friend Miss Charlotte Heywood, they encounter an array of eccentric villagers and visitors. Among Sanditon's most prominent residents: Lady Denham, a childless, twice-widowed dowager with a fortune to bequeath and a flight of distant relations circling for a place in her will. The Darcys have scarcely settled into their lodgings when Lady Denham unexpectedly invites them to a dinner party. Thirteen guests assemble at Sanditon House - but their hostess never appears. As a violent storm rises, a search for Lady Denham begins. The Darcys, like most of their fellow attendees, speculate that one of her ladyship's would - be heirs has grown impatient until the guests start to vanish one by one. Does a kidnapper lurk in the centuries-old mansion, or is a still more sinister force at work? As the night grows short, the dwelling's population grows thin, and tales of Sanditon House's storied past emerge, Mr. and Mrs.
Darcy find themselves leading a desperate effort to discover what has happened to Lady Denham and the missing guests, before they all - perhaps even Elizabeth and Darcy themselves - disappear. Award-winning author CARRIE BEBRIS holds a master's degree in English literature and is a member of the Jane Austen Society of North America. A Wisconsin native, she now resides in Ohio. The Suspicion at Sanditon is her seventh book in the critically acclaimed Mr. and Mrs. Darcy mystery series, which also includes Intrigue at Highbury and The Deception at Lyme.